This is an experimental portion of the website. Each keyword starts a script that searches for the keyword on DBpedia which is the structured data version of Wikipedia. The search returns a description to the keyword and an associated image if available. If the search does not return a results, a link to a Google search is presented. The immune system is important for the elimination of harmful foreign pathogens, which it achieves via its ability to distinguish self from non-self. A broad spectrum of pathology may result when the system is not functioning properly; some of the examples include immunodeficiency, autoimmunity, and hypersensitivity. In addition, the immune system is capable of identifying and eliminating cancer cells, and is thus important in cancer surveillance. Bone marrow, which is the source of lymphocyte stem cells and the site of B-cell maturation. For more information, see the Laboratory on Peripheral Blood and Bone Marrow. The thymus, which serves as the site of T-cell maturation. Lymph nodes, specialized sites of antigen presentation (between antigen presenting cells and lymphocytes) and lymphocyte activation and proliferation. The spleen, a site of interaction between blood-borne antigens and lymphocytes and another site for lymphocyte activation and proliferation. Mucosal associated lymphoid tissues (MALT), sites of the immune response toward pathogens that enter via the mucosal surfaces. Examples of MALT include tonsils in the oropharynx, Peyer’s patches in the small intestine, and lymphoid aggregates in the large intestine. MALT also includes various sites of lymphocyte accumulation throughout the respiratory, gastrointestinal, and genitourinary tracts. Antigens at the mucosal surfaces are picked up by the lymphocytes in MALT. Once the lymphocytes are stimulated, they travel to the regional lymph nodes through efferent lymphatic vessels and undergo proliferation. The effector cells then enter general circulation and can return back to the gastrointestinal and respiratory mucosae. The term primary lymphoid tissue is used to describe sites of lymphocyte maturation, including the bone marrow and thymus. Secondary lymphoid tissues are sites of lymphocyte activation and proliferation. These include the spleen, lymph nodes, and MALT. The term lymphoid organ is used to describe lymphoid tissues that are well organized and encapsulated. These include the lymph nodes, thymus, and spleen. The thymus is the primary lymphoid organ engaged in the maturation of T-cells. It is most active during childhood and slowly degenerates after puberty. The thymus is encapsulated and divided into lobules by the interlobular septa, which contain blood vessels. Each lobule features an outer cortex densely populated by lymphocytes and an inner medulla less heavily infiltrated with lymphocytes (and thus less heavily stained). Unlike secondary lymphoid organs, the thymus lacks nodules and afferent lymphatic vessels, and it is not a site where humoral immune responses are mounted. Rather, it is the site of maturation of T-cells. This process occurs in the peripheral to central direction within thymic lobules. The thymic cortex contains immature and maturing T-cells. The larger and more immature T-cells are found in the outer cortex. They undergo mitosis and mature further as they move inward towards the medulla. T-cells that fail to mature properly undergo apoptosis and are removed by the macrophages at the interface of cortex and medulla. Immunocompetent T cells exit the parenchyma via post-capillary venules or efferent lymphatics. Cells forming the structural framework of the thymic parenchyma are epithelial in origin. This is important to keep in mind because the structural cells of all other lymphatic organs are mesodermal. Parencyhmal cells can most easily be recognized in the medulla as large, stellate, pale staining cells. 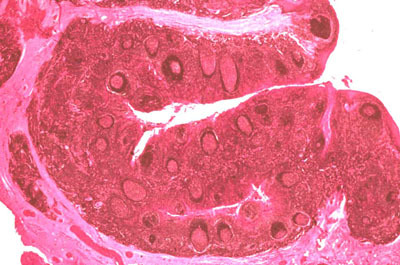 In the thymic medulla, one can find characteristic Hassall's corpuscles, which are composed of keratinized epithelial cells. While the function of these structures is unknown, they may represent a degenerative process since they increase over the course of a lifetime. The medulla is also the site of negative selection, in which maturing T cells that react to self-antigens are eliminated by apoptosis in order to prevent autoimmunity. The gross tissue structure of the thymus depends upon the age of the individual. The organ is large in early life and filled with lymphocytes, but involutes with advancing age, as the parenchyma is gradually replaced by adipose tissue. Lymph nodes occur along the course of the lymphatic vessels. They filter the lymph as it drains back to the bloodstream. Lymph nodes are important sites of interaction between antigens, antigen presenting cells, and lymphocytes. Normally, they are only a few millimeters in diameter. However, when an immune response is initiated, the lymphocytes within the lymph nodes undergo activation and proliferation, causing the nodes to enlarge. Lymph nodes are usually bean-shaped, with an indented region known as the hilum. They are covered by a collagenous capsule that extends into the body of the node as trabeculae. The body of the lymph node is divided into an outer cortex and an inner medulla. The cortex contains a high concentration of lymphocytes while the inner medulla is less cellular. Lymph from the extracellular space carries antigens and antigen presenting cells such as dendritic cells and macrophages from the tissues to the lymph nodes. The lymph enters the node at several points along the lymphatic system through afferent lymphatic vessels. These vessels pierce through the capsule and drain into the space below, known as the subcapsular sinus. From the subcapsular sinus, the lymph drains toward the medulla via channels called the cortical sinuses. As this occurs, it passes through the lymphoid cell mass in the cortex. After reaching the medulla, the lymph drains into a complex network of medullary sinuses. The medullary sinuses converge at the hilum and drain into the efferent lymphatic vessels. The blood supply enters and leaves the lymph node at the hilum. The small arteries enter the lymph node and create a capillary network. Lymphocytes in the blood can then enter the lymph node across the walls of postcapillary venules, which are also known as high endothelial venules, HEV. These HEVs merge into small veins, which then carry blood away from the node. The parenchyma of the lymph nodes is composed of reticular fibers, which support the lymphocytes. Recall from the Laboratory on Connective Tissue and Cartilage that reticular fibers are composed primarily of type III collagen. In the cortex, B-lymphocytes are localized in lymphoid follicles just beneath the capsule. In absence of an active immune response, these follicles are known as primary lymphoid follicles. When an immune response is underway, focal points of intense B-cell proliferation known as germinal centers can be found in some follicles. These follicles then become known as secondary lymphoid follicles. The T-lymphocytes are located deeper within the cortex and are diffusely distributed in the paracortical area.This segregation of B- and T-cells is commonly found in other peripheral lymphoid tissues as well. In the medulla, parts of the cortical cell mass extends as the medullary cords. This region contains macrophages and antibody-secreting plasma cells. Like the lymph nodes, the spleen is covered by an outer capsule that extends into the parenchyma as trabeculae. The majority of the spleen is composed of a matrix called the red pulp, which is the site of erythrocyte disposal. Embedded within the red pulp are small white nodules called the white pulp. These nodules contain the lymphocytes. The splenic artery enters the spleen at the hilus and branches into trabecular arteries. These arteries exit the trabeculae and split into central arteries, which run through the center of the white pulp. 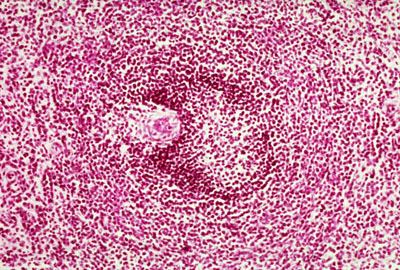 In the white pulp, the vessel is surrounded by the periarteriolar lymphoid sheath (PALS), which is made up of mostly T-cells. At the border of the PALS lies the follicle, which consists mainly of B-cells. Surrounding the follicle are the narrow mantle zone, which contains packed lymphocytes, and a broader marginal zone, which contains more diffuse lymphocytes. After flowing through the central arteries, the blood enters the penicillus in the red pulp. The penicillus consists of a pulp artery, sheathed artery, and capillary. Blood cells arriving in the capillary must traverse this wall and then maneuver their way through the splenic sinuses and the cords of Billroth, which are located between the sinusoids and are composed of connective tissue and macrophages. In the sinuses, old or abnormal red cells that have lost their ability to deform are removed by macrophages, while healthy blood cells can squeeze through the walls of the sinuses and are transported out of the organ by the splenic vein. Three groups of tonsils (palatine, lingual, and pharyngeal) form a ring around the pharynx where the nasal and oral passages unite. Each is characterized by an epithelium forming crypts deep into the parenchyma. 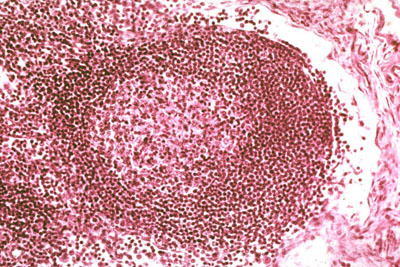 The parenchyma contains several lymphoid follicles with or without germinal centers. The tonsil is usually separated from the underlying tissue by a connective tissue capsule. Peyer's patches are part of the gut associated lymphoid tissue (GALT). They are found throughout the small intestine, but are most prominent in the ileum. The Peyer's patches are essentially groups of lymphoid follicles in the gastric muscosa that bulge into the lumen and form dome-like structures. 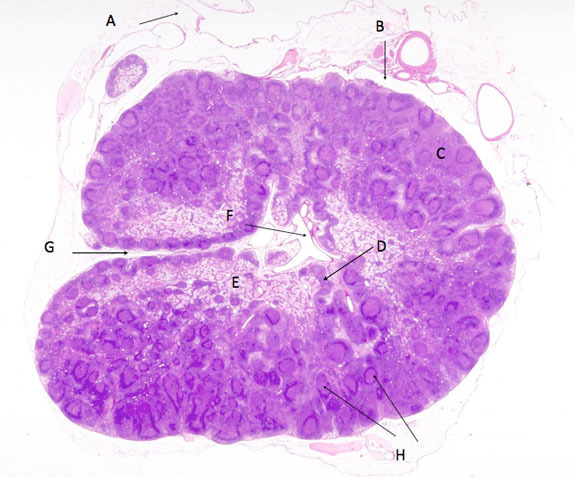 The structure of the follicles here is similar to that of a lymph node: they have follicles (B-cell area) with germinal centers inside, while smaller numbers of T-cells occupy the area between follicles (the equivalent of the paracortex in lymph nodes). The epithelium here is interspersed with specialized epithelial cells called multi-fenestrated or M-cells. 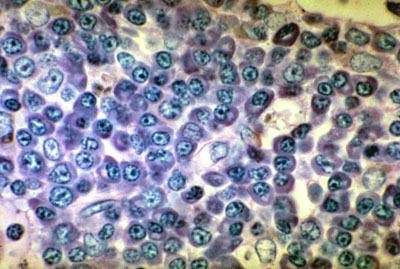 These cells are cuboidal in appearance and have numerous surface microfolds. They function to sample antigens from the lumen and transport them to the Peyer's patches. Lymphatic vessels closely follow the venous portion of the circulatory system. Lymph capillaries arise in the tissue near capillary beds and conduct the lymph through successively larger vessels to converge upon the lymphatic ducts (thoracic and right lymphatic duct), which in turn empty into the great veins at the base of the neck. The lymph nodes are located along this network and act as filters for various regions of the body, returning tissue fluid and lymphocytes to the general circulation. A lymphatic capillary may be distinguished from a blood capillary by its relatively larger lumen and its irregular diameter. The walls of lymph capillaries are composed of endothelial cells and a small amount of connective tissue. They usually lack a continuous basement membrane. Valves are found in the larger vessels, and while these may appear similar to veins, lymphatic vessels contain only a few lymphocytes and no erythrocytes. Suspected of having a rare genetic disorder, a patient and her daughter both have biopsies of their thymus. The biopsy of the thymus of the daughter shows a highly cellular thymus that contains many lymphocytes, while the maternal thymus appears less robust, with large areas of adipose tissue and numerous inclusions. What can you conclude based upon the results of this test? Answer: Nothing! The thymus typically degenerates over time, so the histological features of the maternal thymus, including the sections of adipose tissue and the Hassall’s corpuscles, are completely normal. Explain the acronyms MALT and GALT. Answer: MALT is mucosal associated lymphoid tissue and includes the tonsils and lymphoid patches in the respiratory and gastrointestinal systems. 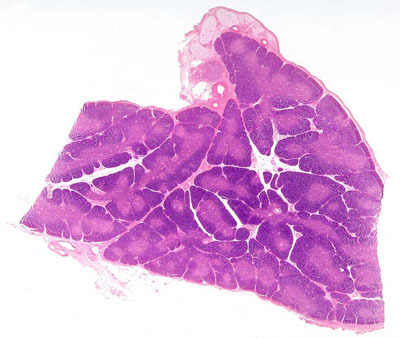 GALT, gut associated lymphoid tissue, is a type of MALT and is present as Peyer’s patches in the wall of the gut. Explain the structural organization of blood flow through the spleen. Answer: Blood enters the spleen through the splenic artery and flows into central arteries, pencillary arteries, and sheathed capillaries. It then enters the sinusoidal space, and leaves the spleen through the splenic vein. Explain the organization of B- and T-cells in the lymphatic tissue. Answer: B-cells are typically located in follicles within the cortex. T-cells are located in the paracortical spaces, which are between the B-cell follicles. How might you distinguish a venule from a lymphatic capillary? Answer: Venules have thicker walls are filled with red blood cells, while lymphatic vessels have thinner walls and usually lack cells in the lumen, although some lymphocytes may be present. Lymphatic vessels also lack continuous basement membranes. Please select whether to view the slides in study mode or quiz mode. In study mode, the images will contain labels and a description. In quiz mode, labels and description will be hidden. Start at low power and identify the capsule, the cortical region, the medullary region and trabeculae. At low power, identify the following: capsule, cortex, paracortex, medulla, and hilum. At low power, differentiate between red pulp and white pulp. What cell type is produced at this site? What is the primary function of this organ? Why are the darker staining regions called "white pulp?" Name the cell type (in this case, in the lymph node). Identify A, B, C, D, E, F, G, and H in this section of a lymph node. Splenomegaly is a classic sign of malaria infection. Based on what you have learned about the structure of the spleen, explain why you would expect this organ to enlarge in a patient with malaria. Answer: In malaria infection, the parasite causes the lysis of red blood cells. These damage red blood cells enter the spleen, where they cannot maneuver through the sinusoids effectively. They become caught in the cords of Billroth and accumulate. 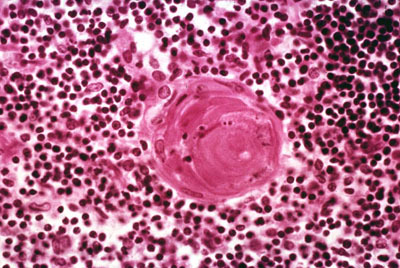 This also causes the activation and migration of macrophages, whose job it is to destroy the damaged red blood cells. Because of the accumulation of erythrocytes and the inflammation caused by macrophages, the spleen enlarges. A lymph node biopsy is often used to determine the progression of certain cancers. Explain the logic in basing the stage of a tumor upon the number of lymph nodes affected. Is this a perfect science? Answer: The pattern of lymph node involvement in cancer mirrors the natural routes of lymphatic drainage. Therefore, more affected lymph nodes imply a greater likelihood of metastasis. Generally speaking, having 4 affected lymph nodes represents a metastatic cancer that will require additional treatment beyond surgical removal of the affected tissues and nodes. This is, however, a generalization. Nothing in science or medicine is perfect.